The Center for Environmental Concerns (CEC) is a non-government organization founded in 1989 through the initiatives of organizations representing fisherfolk, farmers, indigenous people, women, urban poor, church people and professional sectors. CEC strives to help communities address environmental challenges through research, policy advocacy, training, community services and local and international networking. We are writing this letter in solidarity with organizations from different countries that are calling to immediately cancel coal-fired power plant projects of your corporation. We would like to voice our concern based on the experience of communities near the coal-fired power plants (CFPPs) and on numerous studies on its impacts to the environment. In addition, the IPCC report on the 1.5 degree Celsius warming states that drastic and rapid changes to fossil fuel-based energy systems should be done within ten years to avoid going past the 1.5 degree Celsius target. Filipino fisherfolk, particularly in Barangay Ibabang Polo, Municipality of Pagbilao, Quezon Province, have felt the impacts of CFPPs. 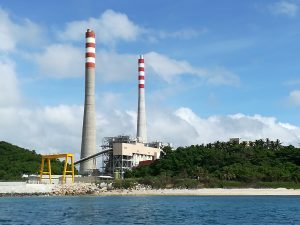 The Pagbilao Power Station Complex (PPSC) location in Barangay Ibabang Polo, Municipality of Pagbilao, Quezon Province, Philippines is currently owned by TeaM Energy Corporation, a joint venture company of Marubeni Corporation and Tokyo Electric Power Company, and Aboitiz Power. The construction and operation of the first two units were faced with opposition of the fisherfolk. They formed organizations and held different protest actions because of the displacement of their homes and their observed impacts on coastal ecosystems, specifically the cutting of mangroves and the warming of the water especially near the outfall. Despite the opposition, the expansion still pushed through and started operations this year. According to a rapid impact assessment conducted by our organization, it was noted that the pH values in the sampling sites did not pass the standards of the country’s Department of Environment and Natural Resources- Environmental Management Bureau. In addition, interviews showed that the fisherfolk has observed a decline in fish catch and they attributed this to the warming of the water in their fishing grounds as well as the worsening state of quality of marine ecosystems. These changes were noticed after the construction of the PPSC. The fisherfolk also observed that the kinds of fish that able to catch are less varied than before. Many of the residents who were promised stable and well-paying jobs in the PPSC are now being offered contractual jobs or job orders. The promised development in the island by the project proponents were not felt according to the residents. It should also be emphasized that the outfall is located in a key biodiversity area. With these findings, we, the Center for Environmental Concerns – Philippines call on the Marubeni Corporation to stop the operation of the PPSC, stop the expansion and construction of new coal-fired power plants (CFPPs), and stop supporting such projects not only in our country but also across the globe. Furthermore, we recommend that Marubeni Corporation provide alternative livelihood programs, and means and resources to rehabilitate ecosystems in Barangay Ibabang Polo and other sites of their CFPPs. We are fervently asking you to consider our appeal for the people, especially the fisherfolk as the poorest sector in country, and for the environment.